There’s nothing lovelier than Christmas in Connecticut, but Melanie Travis can scarcely find a moment to enjoy the festivities. With her youngest son approaching toddlerhood, she’s decided to return to her old job at Howard Academy, a posh private school attended by the children of Greenwich’s well-heeled gentry. Balancing work, motherhood, and the hectic dog show circuit takes some fancy footwork, especially when the headmaster taps her to be the chairman of the school’s Christmas Bazaar. The Christmas Bazaar is Howard Academy’s biggest and most important fundraiser, so Melanie feels the pressure to make it a huge success. But everything goes awry when a prize show dog goes missing and Santa turns up dead. The dog’s owner is one of the school’s most perfectly pedigreed alums, and she enlists Melanie to help find the purloined pooch. 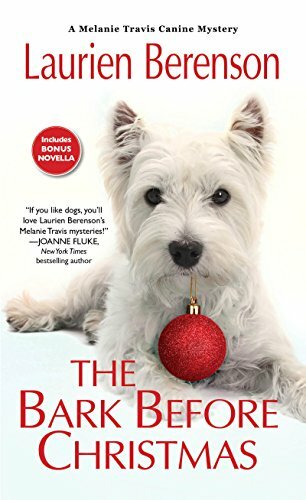 But just as Melanie starts pawing at the truth, she digs up a sleighful of sinister secrets that leaves everyone feeling less than merry . . .